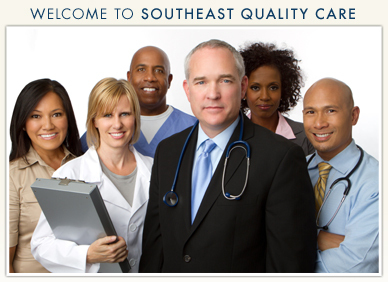 Southeast Quality Care, LLC (SEQC) was established in 1995 to support the efforts of its Members and Provider Affiliates to provide high quality care to their patients in a changing health care marketplace. SEQC’s Members are medical practices with affiliated physicians and other licensed providers which are primarily located in Gaston, Cleveland and Lincoln counties. SEQC’s Affiliates provide the full spectrum of specialty and primary care services. Licensed mid-level providers include Physicians Assistants, Nurse Practitioners, Optometrists and Certified Nurse Midwives among others. All licensed professionals are fully credentialed when they join a Member practice and recredentialed every three years thereafter. Currently, the network consists of over 100 physician affiliates and 37 licensed mid-level providers in 47 practices. Our 27 Primary Care practices include Family Practice, Internal Medicine and Pediatrics. Specialties represented are: Cardiology, Critical Care, Dermatology, Endocrinology, Gastroenterology, Hematology & Oncology, Infectious Disease, Gastroenterology, Obstetrics & Gynecology, Ophthalmology, Orthopaedics & Orthopaedic Surgery, Otolaryngology, Podiatry, Psychiatry, Pulmonology, Radiology, Sleep Medicine, Surgery – including General, Vascular, Thoracic, Cardiovascular, Neurosurgery, Plastic Surgery and Hand Surgery. SEQC’s goal is to provide employers and managed care plans with a high quality network of providers that meet the needs of the communities served by SEQC. SEQC’s Members and Provider Affiliates take special pride in their communities and work together to provide the best medical care to all of their patients. HCOC CMG, LLC - dba The Hand Center of the Carolinas, P.A.